Polizei: He needs a new job. A German man, who surely must be one of the world’s most inept crooks, turned himself in to Polizei after botching four robberies in one day and getting trapped in his getaway car when he rammed a bank van. via Ananova – Useless robber hands himself in. November 28, 2009 Posted by oldstersview | cops, Dumb Crook	| Polizei | Comments Off on Polizei: He needs a new job. The sequence of events happens dozens of times every day at the BP gas station/convenience store at U.S. 19 at Nursery Road. An unsuspecting customer pulls up to the drive-through window. But instead of a store clerk, up pops two paws, deep brown eyes and the tongue-flapping grin of a happy chocolate Labrador retriever named Cody. Kids in the back seats of minivans often squeal with joy. Even the usually stony faces of gruff construction worker-types can&apos;t help but crack a smile under the dog&apos;s unpretentious greeting. More at St. Petersburg Times. November 25, 2009 Posted by oldstersview | animals, cool stuff, dogs, Fun stuff, retail	| chocolate lab | Comments Off on Fill ‘er up? Thinking about fish for dinner? This one may eat you instead. 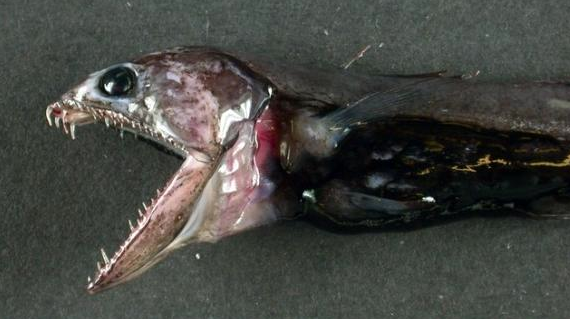 Chiasmodon niger, a deep sea fish sometimes called “the black swallower,” can devour fish larger than itself. 21 other images at Census of Marine Life – FOXNews.com. November 23, 2009 Posted by oldstersview | animals	| black swallower, fish | Comments Off on Thinking about fish for dinner? This one may eat you instead. 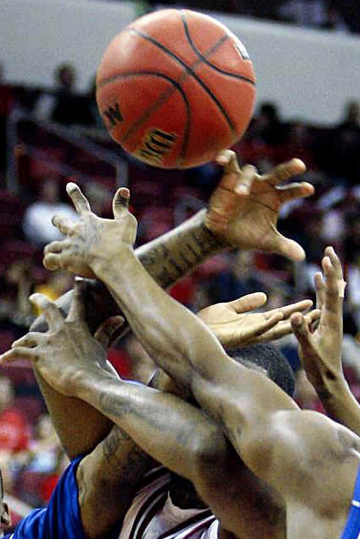 Basketball is a non-contact sport, right? November 22, 2009 Posted by oldstersview | Fun stuff, games	| basketball | Comments Off on Basketball is a non-contact sport, right? via Neon Elmhurst Hospital Sign Burns Out Appropriately – Asylum.com. 2012: DOOMSDAY!! Yawn. Another one? Much more at The Doomsday List. November 22, 2009 Posted by oldstersview | Dumb Stuff	| 2012, Doomsday | Comments Off on 2012: DOOMSDAY!! Yawn. Another one? This would make a great Halloween stunt. The only woman to be convicted of witchcraft in New Hampshire was Goodwife (Goody) Eunice Cole of Hampton. This unfortunate creature was found guilty, lashed with a whip, and thrown in jail. She was sixty-four at the time. New Englanders in the seventeenth century feared the devil. They believed that all natural disasters were caused by a person who was possessed by “Old Nick.” If their crops failed, if a cow went dry, or if an epidemic struck, they blamed someone in the community, usually an eccentric old person. In Salem, Massachusetts nineteen people were hanged for witchcraft, some on testimony given by excitable children. Goody Cole was lucky to escape with her life. Townspeople were convinced of her guilt. Neighborhood children claimed they had seen her take the form of a dog, a cat, and an eagle. They said they had seen the devil, in the form of a black dwarf with a red cap, sitting at her table. This woman is just one example of the result of theological control of civil affairs. After Lisa Bendall and her daughter spotted some unusually coloured slugs while walking to school one day, they launched an investigation that has the world of amateur and professional malacologists (that’s slug- and snail-watchers to you and me) scratching their heads. “We were in awe,” says Bendall, a freelance writer, of the pumpkin-coloured things, which are 10 centimetres [about 4 inches] long when extended. More at 10 cm Etobicoke slug a big, slimy mystery – thestar.com. Were you married in Texas? Are you sure? Texans: Are you really married? Barbara Ann Radnofsky, a Houston lawyer and Democratic candidate for attorney general, says that a 22-word clause in a 2005 constitutional amendment designed to ban gay marriages erroneously endangers the legal status of all marriages in the state. More via Top Stories | Star-Telegram.com. 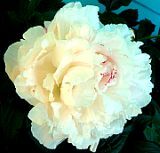 November 18, 2009 Posted by oldstersview | Dumb Bureaucrats	| marriage, Texas | Comments Off on Were you married in Texas? Are you sure? Russ Sittloh says a mysterious serpent-like creature that’s at least 20 feet long has been swimming in the canal behind his Madeira Beach [Florida] home and he wants to find out what it is. “The head will come up and then it will disappear and then the next thing you know, you’ll see a couple rolls behind it,” Sittloh said. Sittloh has named the creature “Normandy Nessie” after the road he lives on. The 78-year-old retired engineer has also set up a camera to capture video of the creature and so far he’s recorded “Normandy Nessie” six times. video at 10connects.com | Tampa, St. Petersburg, Clearwater. Wait. The hole was made so the dog could steal chickens? A Chinese burglar got stuck after he tried to crawl through a tiny opening built for a farmer’s pet dog to steal some chickens. via Ananova – Hole in wall traps burglar. That’s an accommodating man…making a hole in the barn wall so the dog could get in to steal chickens. Dig out those skirts, girls. The Paris cops said so. A decree banning women from wearing trousers in Paris is still technically in force, it emerged on Monday, making the laissez-faire French capital theoretically stricter than hardline Sudan in the fashion stakes. The rule banning women from dressing like men – namely by wearing trousers – was first introduced in 1800 by [the] Paris’ police chief and has survived repeated attempts to repeal it. The 1800 rule stipulated than any Parisienne wishing to dress like a man “must present herself to Paris&apos; main police station to obtain authorisation”. In 1892 it was slightly relaxed thanks to an amendment which said trousers were permitted “as long as the woman is holding the reins of a horse”. Then in 1909, the decree was further watered down when an extra clause was added to allow women in trousers on condition they were “on a bicycle or holding it by the handlebars”. More via Women banned from wearing trousers in Paris – Telegraph. November 17, 2009 Posted by oldstersview | Dumb Bureaucrats, Dumb Stuff, Strange	| Paris, trousers | Comments Off on Dig out those skirts, girls. The Paris cops said so. It’s a unique concept according to its creators. A hotel in the French city of Nantes is offering the chance for people to become a hamster. For 99 euros (£88) a night, visitors to the hotel in Nantes can feast on hamster grain, get a workout by running in a giant wheel and sleep in hay stacks in the suite called the “Hamster Villa”. How do you tell if an elephant is fat? The Edmonton Zoo has put Lucy the elephant on a diet and exercise program to reduce her weight by 1000 pounds in the coming year to help with her breathing and arthritis problems. via Zoo puts pudgy pachyderm on diet. November 14, 2009 Posted by oldstersview | animals	| diet, elephant, exercise | Comments Off on How do you tell if an elephant is fat?